So, now we're all settled in our new little corner of our company. Since lack of empty whiteboard space always seemed to be an issue, we decided to use the walls as much as we possibly could. 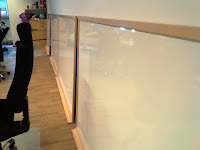 The principle we used for placing the whiteboards can be seen on the picture. If it's a wall space, it deserves some whiteboarding. And yes, we did put up the whiteboards on the wall. Now we have as many whiteboards as we have developers in the room. Our CEO came into the room and his first reflection was: "Oh, how many whiteboards." And then he'd only seen one third. If it's Feng Shui, I wouldn't know. But it's sweet.